Fact: Propane was stored in the caverns proposed by Crestwood for methane gas storage from 1964 to 1984 by TEPPCO Partners. It is not currently stored here. One of the caverns is known to have had a collapse, and salinity levels in Seneca Lake spiked during this time. Beginning in 1982 they moved their storage operation across the road, away from the lake, into a highly engineered shallow rock cavern far removed from the salt layer. proposed expansion and its related above-ground infrastructure is something entirely different and would tip the scale from balanced coexistence to an industrial landscape that is not compatible with the comprehensive plans, the land use laws, or the vision that so many have worked to achieve in the Finger Lakes. That is why over 340 regional businesses and 31 municipalities (Counties, Towns, Villages and Cities, including the Cities of Geneva, Rochester, and Syracuse) officially oppose Crestwood’s proposal. This is not business as usual, and local business owners and elected officials know it. Facts: Salt caverns make up only 7% of the underground gas storage in the United States. 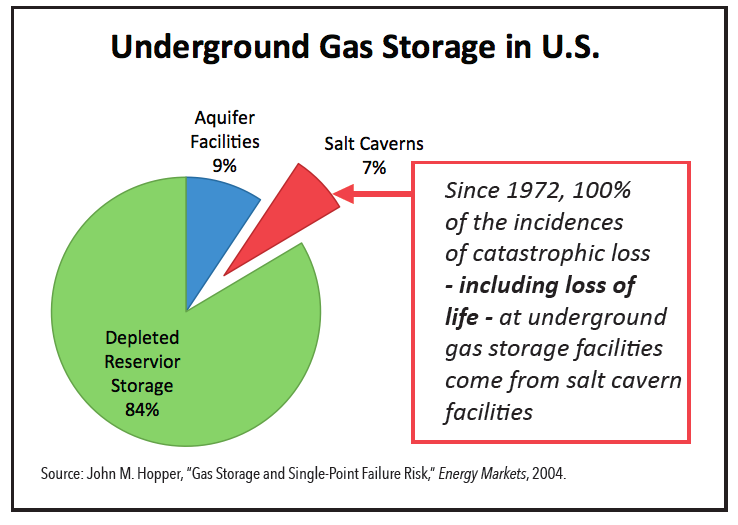 Of the catastrophic accidents with underground methane and LPG storage, 100% of them have been at salt cavern storage facilities since 1972. April 7, 1992- Brenham, TX–LPG stored in underground salt caverns operated by MAPCO Natural Gas Liquids Inc. leaked and ignited “with the force of a three-kiloton bomb.” More than 60 buildings within 3 square miles of the facility were damaged. Dozens were injured and three people were killed, including a 5-year-old boy. Twenty-five homes were destroyed. August 19, 2004 – Moss Bluff, TX–Two explosions within 24 hours led to the evacuation of residents in a three-mile radius of this Duke Energy facility which stored natural gas in underground salt caverns. It is vitally important to understand that the solution mined salt caverns at Seneca Lake are not only salt. They consist of layers of salt interbedded with layers of shale, creating interfaces through which gas may leak.